Running water in your home or business! Do you ever take that for granted? If you have well water, you know that it's important to keep the well in top working condition and to call a professional plumber at the first sign of trouble. Andrews Plumbing has experience with troubleshooting well water problems. 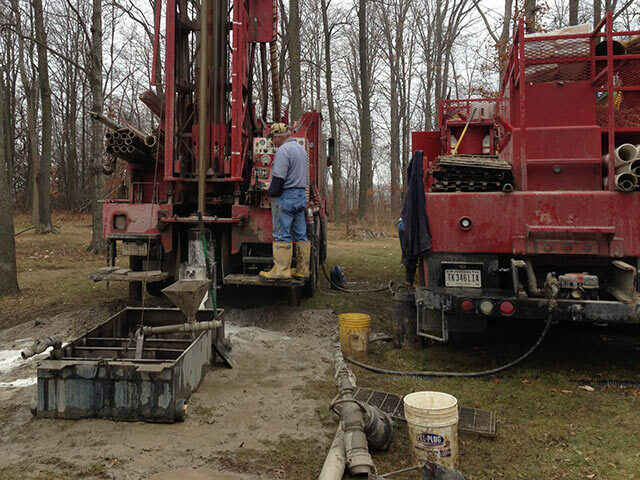 We have diagnosed and repaired hundreds of wells over the years. The most obvious sign of a broken well pump is absolutely no water in your home or business. Less obvious signs of water pump failure include low water pressure, cloudy water, and unusual noises. If you hear your pump running constantly, or you think your pump is short cycling, those are signs that your well pump may have failed, or can fail very soon. Low water pressure, or losing water pressure throughout the day can be signs of something less serious like a broken gauge or a pressure switch that needs to be replaced. Andrews Plumbing uses a systematic approach to troubleshoot your well issues. Many times, if parts are available, well repairs can be made the same day. Andrews Plumbing can run water tests for you and give you a report. The results of this test will give you a breakdown of the different minerals, bacteria, contaminants, heavy metals, and other dangerous substances. Your water is tested for Coliforms which are an indicator of human or animal waste contaminating your well. High Nitrate levels indicate that there could be fertilizers, pesticides, septic system leaks, or nearby sewer line leaks. Additional tests are done for pH, mineral content, hardness, and other materials that may cause problems with odor, staining, and the color of your water. Andrews Plumbing can provide appropriate treatment for problem wells to keep your drinking water healthy and safe to drink. Well water can suffer from contamination from run off, buried well heads, bacteria, sediment, and hazardous materials.This one step, is quick, easy, reliable and relatively inexpensive. Test your water annually, or call Andrews, we can test if for you. Homeowners can prevent well water contamination with very little effort. Your wellhead is probably located within 50 feet of your home and is the above ground access point for your well. Keep this area free of debris, leaves, snow, oil, chemicals and other hazardous materials to prevent contamination of your well water. Consider a decorative covering for your wellhead to keep it free from debris, prevent accidents, and make it easy to locate. Slope the land around the wellhead for proper drainage. Do not allow anything to back up into your well, including pesticides and lawn treatments. Maintain safe distances between your well and septic areas. Have a professional well inspection and water quality test done annually. Andrews Plumbing performs well repair, well inspection, and well maintenance. Your Annual Well Inspection check should include proper functioning of the well pump and pressure switch, bacteria test, and a drinking water test. It's easier and less expensive to repair your well before it becomes an emergency situation. Occasionally we see wellheads that are buried in the ground. This practice can lead to well water contamination and make the wellhead more difficult to locate. It's a relatively easy procedure to extend that well head above ground to prevent contamination as well as make the wellhead easier to find. Ideally, your wellhead should extend at least 12" above ground. Andrews Plumbing regularly services the areas of Northeast Indiana and Northwest Ohio. Adams County, Indiana, Decatur, Monroe, Berne, Geneva and the surrounding areas. Wells County, Indiana, Ossian, Bluffton, Markle, Poneto and the surrounding areas. Allen County, Indiana, Ft. Wayne and the surrounding areas including New Haven, Hoagland, Monroeville. Northwest Ohio, Van Wert, Wilshire, Convoy, Wren, and the surrounding area.